Lagos State Governor, Mr. Akinwunmi Ambode on Saturday assured President Muhammadu Buhari that residents in Lagos would troop out en masse on February 16 and deliver the State to him and other National Assembly candidates of the All Progressive Congress (APC). PoliticsNGR learned that Governor Ambode, who spoke at the APC Presidential Mega Rally, held at the Teslim Balogun Stadium in Surulere, Lagos, said the President in the last three and half years fully supported the infrastructural growth in the State and would do more if given another mandate of four years. According to him, the February 16 election was not about tribe or religion, but strictly about job creation, infrastructural development and economic growth, saying that President Buhari has shown total commitment to making life comfortable for residents. "In and outside of the stadium, you can see the crowd that has turned out here and we are very grateful that Lagos has been signed, sealed and delivered to APC already. The message is very clear. "We appreciate Mr. President for his support to our State in the last three and half years. The achievements that we have recorded in Lagos were possible because of his support. This election is not about tribe or religion, it's about infrastructure, jobs and the economy and the right path to go is to go to the APC. "if you see what we are going in Lagos already, you will see that the Airport road is not for the Yorubas or the Igbos or the Hausas, its about making life comfortable for Nigerians and that is why Mr. President has continually supported all our projects by even refunding some of the funds we used for capital projects so that we can complete more projects," Governor Ambode said. He said it was important for Nigerians to entrust President Buhari with another four years in office to continue in the trajectory of growth, warning that the return of the opposition party would do nothing but alter the progress made by the Federal Government so far. "If you remember, the first two years of this administration we were in recession caused by the PDP, but in the last two years, we have stabilized, we have created the groundwork for growth and that is where APC is different from the PDP. They will tell you that they want to make Nigeria work again, but ask them who destroyed Nigeria in the first place? "Therefore, this election is about moving the economy forward and for this to be possible, we need to continue on the foundation that we have already made in the last four years. APC remains one party, we remain one nation and one family," the Governor said. 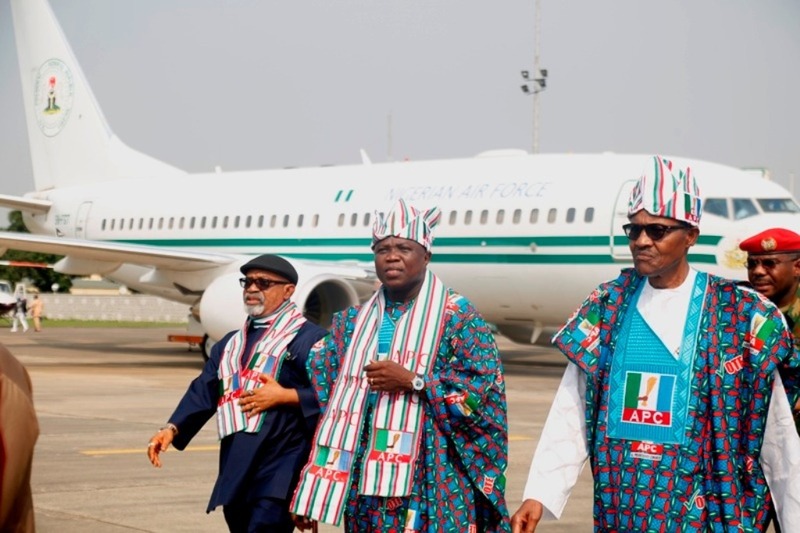 Buhari, who made his entrance into the venue of the rally at about 2:45pm to a tumultuous welcome by the teeming crowd and party faithful, assured that Lagos as commercial capital of Nigeria would continue to receive greater attention in terms of infrastructural renewal and all round economic growth. Speaking earlier at a session with members of the Organised Private Sector held at Lagos House, Marina, President Buhari said it was gratifying to note that the economic policies of his administration were already making the desired impact as evidenced by steady growth in the economy in the last three years. He said the APC government had kept the promise to boost the economy through blocking leakages in government finances, increasing capital expenditure and inflows, and implementing the Economic Recovery and Growth Plan (ERGP), among others. “I firmly believe that our economic policies are beginning to make the desired impact. Economic growth has resumed and is continuing to improve. Growth was higher in 2017 than in 2016, data even from external sources shows that it was also higher in 2018 than in 2017. I am confident that as we stay the course, it will be better still at the end of 2019. “Inflation is coming down steadily, there is stability in the exchange rate and foreign exchange is readily available for genuine business. Foreign reserves are adequate and growing; capital inflows have increased and the trade balance is positive. “We are paying off debts that were not even publicly acknowledged before now, including those owed to States, the electricity sector, oil marketers, exporters, backlog of salaries of workers and pensioners, amongst others,’’ he said. Among the organizations which made presentations to the President at the session were Manufacturers Association of Nigeria (MAN), Lagos Chamber of Commerce and Industry (LCCI), and Nigerian Association of Small and Medium Enterprises (NASME). Aside Vice President, Professor Yemi Osinbajo, Governors of Oyo (Abiola Ajimobi), Kebbi (Atiku Bagudu), Kano (Abdullahi Ganduje), Osun (Gboyega Oyetola), Ekiti (Kayode Fayemi) and Ministers, the session was also attended by many captains of industry including Alhaji Aliko Dangote, Femi Otedola, Oba Otudeko, Jim Ovia, Bismarck Rewane, Chief (Mrs) Nike Akande, among others. The rally was well attended by the who's who in the APC including the Governors of Ogun, Osun, Oyo, Ekiti, Ondo, Edo, Kano, Kebbi, National Leader of the APC, Asiwaju Bola Ahmed Tinubu; Mr. Babatunde Fashola, other serving and past Ministers, party chieftains, among many others.